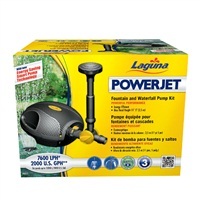 High performance fountain & waterfall pump kit. Max Flow Rate: 7500 litres per hour/1652 UK GPH. Max Head Height: 3.70 metres. Includes fully controllable riser stem and 2 fountain heads. For ponds up to 15000 litres/3304 UK gallons. Low running costs: 100 watts.